in the Hard Disk Drive Duplication/Erasure industry. 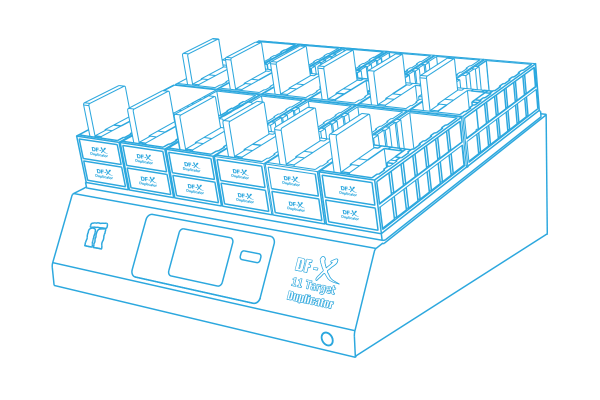 Built for high-volume applications, the DFX-11 (F-SATA-DFX-11) disk duplicator is robust and designed as stand-alone duplication/erase system that can accommodate today's most demanding interface environments. The DFX-11 can selectively copy program software and data from one (1) source drive to eleven (11) target disk drives simultaneously. Ideal for big jobs, its intelligent mode enables the custom configuration of drives, including partitioning and formatting during the duplication process. Target drives with relatively small images that are identical to the source drive may be ‘Smart Copied’ to reduce copy time or ‘Mirror Copied’ for larger images, sector by sector at Data speeds up to 18GB/min. with Erase speeds of up to 26 GB/min. See the DFX-11 Flyer for more detail. 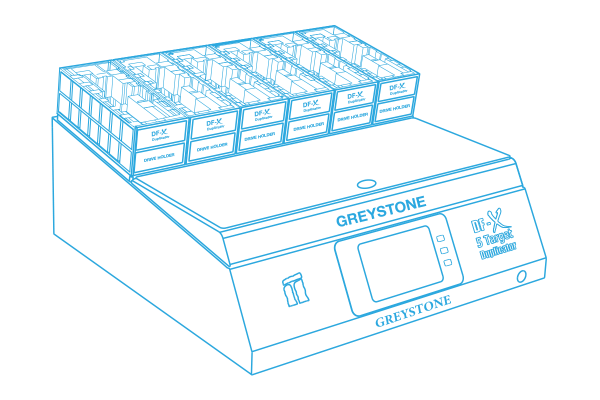 Built for medium to large jobs, the DFX-5 (F-SATA-DFX-5) disk duplicator is designed as a stand-alone duplication/erase system that can accommodate today's demanding rollouts. With the capacitive-touch-screen and large high resolution 5” LCD display, the DFX-5 can selectively copy program software and data from one (1) source drive to five (5) target disk drives simultaneously, just by one touch. Ideal for medium to high volume applications and priced appropriately, its intelligent mode enables the custom configuration of drives, including partitioning and formatting during the duplication or Erase process. Target drives with relatively small images that are identical to the source drive may be ‘Smart Copied’ to reduce copy time or ‘Mirror Copied’ for larger images, sector by sector at Data speeds of up to 18GB/min. with Erase speeds up to 26 GB/min. See the DFX-5 Flyer for more detail. 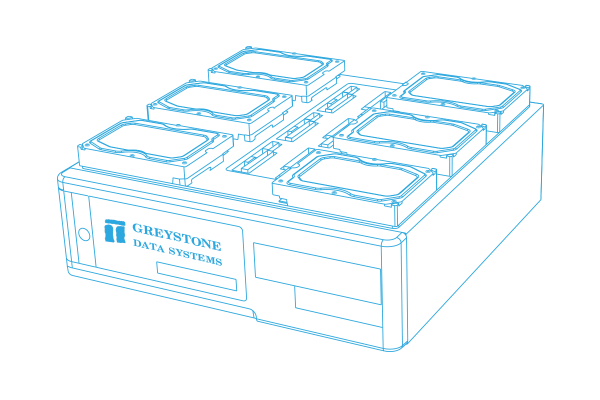 The DF5 (F-ATA-DF5-P/S) PATA/SATA disk duplicator is designed to be used as a stand-alone duplication system to selectively copy program software and data from one (1) source drive to five (5) target disk drives simultaneously. This mature but still in demand duplicator/erase UDMA system is still Ideal for low volume applications. Coupled with a keyboard and monitor for data analysis augments the systems characteristics. With speeds exceeding 3 GB/min., its ‘SmartCopy’ option enables both Delta and Twin copy modes for greater throughput and offers DoD Erase (5220.22M) as standard. Target drives that are identical to the source drive may be ‘mirrored’ or duplicated exactly sector by sector. See the DF5 Flyer for more detail. Data Fast 1 (DF-1) is a fast and stand alone hard disk drive duplicator. This machine is effectively used to copy program software and data from a source to a target. It may run at the speed of up to 4GB/min. A source drive may be “mirror” duplicated or copied exactly to a target drive, sector by sector, regardless of the source’s file systems. DF-1 intelligently auto-sets the UDMA mode corresponding to the mode the target drive supports. You are also able to manually set the UDMA modes for duplication. The system is using navigation keys and some other keys on keypad to move the cursor to the function you wish to run.